Hotel Carolina — Raleigh, N.C. This week we present our first Flashback Friday follow-up. In last week’s Raleigh bus station post we posed the question to identify the tall building seen looming in the background. Several readers correctly identified it as the Hotel Carolina. 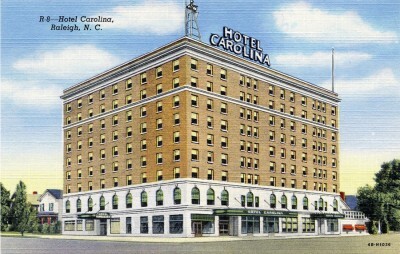 The Hotel Carolina is located on the corner of S. McDowell and W. Hargett Streeets. It is a modern hotel and has 250 rooms. 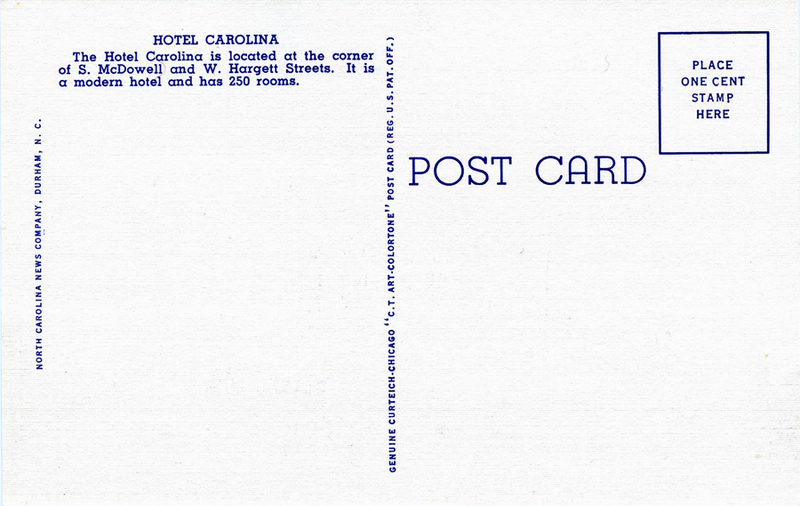 It certainlty was a “modern hotel” when this Curt Teich “Art Colortone” linen postcard was printed in the early 1930s, but the publisher got the address wrong — the hotel was actually located at the corner of W. Hargett and S. Dawson. 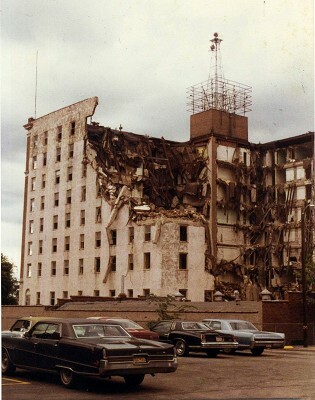 Seen below is a ‘real photo’ of the Hotel Carolina taken during its demolition 30 years ago. The view is from the bus station parking lot. As a small child I like to visit the small soda fountain on the ground floor of the hotel. I’d return it if the hotel were still standing, but alas I read in this article that the hotel is gone. I may send it to a Raleigh historical museum instead. Quite a coincidence that the hotel’s postcard and a key fob surfaced the same spring! I have just come into possession of four electric brass chandeliers from the Sphinx Club at the Carolina Hotel, complete with glass lanterns and green globes. Anyone interested? Call me in New Bern. That hotel, like so many other buildings in Raleigh, was demolished by Wadsworth Wrecking. L. T. Wadsworth was quite a character. I believe one of his workers was killed during the demolition when he stuck his head inside the elevator shaft to see if the elevator was coming. Alas – it was. I remember singing in the ballroom with the Raleigh High Glee Club in the early 1940s. 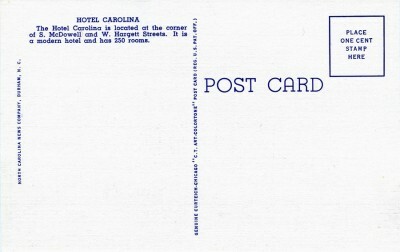 anyone know of any links to information or articles about the history of the hotel carolina? I lived there for a year as an nc state student due to lack of dorm space in the 1970s. it was quite an experience and I would like to find out more about it. however google searches are proving inadequate. any suggestions or help would be appreciated. I actually lived in the Carolina Hotel for 2yrs 1968-70 while I was a student at Shaw University. I had a one bedroom efficiency apartment there. I really enjoyed living there. I lived in room 929 (top floor) from May ’69 to Jan ’70 after graduating from college and moving to Raleigh to work at the [then] adolescent RTP. My room overlooked the long demolished Trailways bus station. The monthly rental was $70 which was a bargain considering the many “Mom and Pop” eateries which existed downtown then. The hotel even had maid service and full-time bellhops with a soda shop on the ground floor. A relic of a by-gone era. When I was 5 years old my father was the hotel assistant manager. ( 1958-1959 ) We lived in an apartment on the 9th floor. The grand piano, the stairs, the lobby all seamed massive in my ancient memories. I disliked the barber shop but the drug store and restaurant is a different subject. My fondest memory is sometimes being allowed to operate the old elevators. I think I got pretty good at it. Was not there a park across the street? I stayed at the Hotel Carolina on Nov 23, 1972. I remember that everything seem so immense. The next morning I was taken to the airport and flew to Lackland AFB to begin my 20 years in the AF.